FILE - A convoy of Turkish military trucks is seen carrying tanks destined for Syria near the town of Kilis, Turkey, Sept. 14, 2018. Military attacks by Syria and its Russian ally against Idlib have been increasing in frequency and intensity during the past weeks. The United Nations reports dozens of people, including women and children, have been killed and wounded, and several hospitals and schools have been attacked and taken out of service. The United Nations warns an offensive to retake Idlib, where nearly three million civilians reside, would trigger the biggest massacre of this century. Paulo Pinheiro, Chairperson of the Commission of Inquiry on Syria, attends a news conference at the United Nations office in Geneva, Switzerland Sept. 6, 2017. 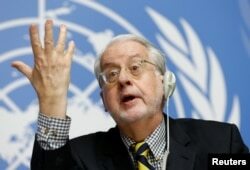 In a presentation to the U.N. Human Rights Council, Commission of Inquiry on Syria Chairman Paulo Pinheiro notes unlike previous battles in Dara'a or eastern Ghouta civilians in Idlib have nowhere left to flee. War in Idlib, he says, would generate a humanitarian catastrophe. Syria's ambassador to the U.N. Hussam Aala attends as President of the Conference on Disarmament at the United Nations in Geneva, Switzerland, May 29, 2018. In response, Syria’s ambassador to the United Nations in Geneva, Hussam Edin Aala, said his government respects all rules of international humanitarian law and has taken all necessary measures to protect civilians during operations to liberate areas from terrorist groups. The United Nations estimates about 10,000 rebels are intertwined among the civilians. The commission says risking the lives of so many innocent people in a battle to defeat a relative handful of armed fighters is too high a price to pay.